If you know me in real life at all or even if you’ve read some of the past entries in this blog you know that I love polar bears. This year my birthday present from my husband was a trip to the Buffalo zoo to see the two polar bear cubs they have there right now. For good or ill, he always seems to get me presents I have to work for. This was minimal in that I only had to pick a date for our trip. Though he totally could have surprised me and taken me up on my birthday if he had just canceled the lunch plans I had made with friends for that day. The bears would have been even cuter then since they would have been even smaller. Since the end of June and all of July were already really busy, we didn’t wind up getting to go until yesterday. We literally just flew up for the day. We left Baltimore at 9:40 am and returned at 7:45 pm. I must say it’s kind of nice traveling with no luggage. I’ll probably never have occasion to do it again. We hopped a cab at the airport and took it to the zoo. I’m guessing we are the first people to have ever done that before. The smallest polar bears I had seen previous to yesterday were a number of years ago at the Pittsburgh zoo. The twin brothers were about 18 months old. The polar bears at the Buffalo zoo are much younger than that currently. Luna is 8 and half months old and was born at the Buffalo zoo, though her parents have since been moved to other zoos. Her mother rejected her as a baby and she was initially raised for the first few months by one of the zookeepers at her house. Kali is 7 and half months old and was rescued in Alaska after his mother was shot and killed. They moved him from the Anchorage zoo to the Buffalo zoo so the two cubs could grow up together and teach each other how to be bears. They are working on raising money for a new polar bear enclosure, but right now the space where they live is pretty sad especially compared to the enclosures I’ve seen for the polar bears at the Maryland Zoo and the Pittsburgh Zoo. The Pittsburgh Zoo is especially cool in that you can stand underneath their water pool and watch them swim from below. Based on their website and signs up at the zoo the polar bears were supposed to be out on view daily from 11:30-2. I suspect all this information is out of date as they actually only reference Luna and not Kali and when we arrived a little after 11 they were already out. They did go back inside for about 10 minutes prior to 11:30 presumably to be fed, but then they were out at least until a little after 2 when we left. They did not get called back in right at 2, so I don’t know if they were left out longer or if they were just not prompt with bringing them inside. By that point I was hungry though and also looking forward to sitting down after essentially standing in one spot for two and half hours. Most people spent about an average of 5-10 minutes looking at the polar bears before moving on. We were pretty much just there to see them, so we spent two and half hours watching them, then zoomed through part of the zoo on the way to the exit and left. I really don’t like zoos that much, but they’re my only chance to see polar bears (at least until I can convince Paul to take me on a polar bear tour in Manitoba). The polar bear cubs were of course super adorable. You can see some of the pictures and videos I took yesterday below. This is when they first came back out after being called inside for a few minutes. Watch until the end to see some super cuteness. Kali playing in the water. They spent a lot of time in there and would wrestle with each to gain control over the water hole. After we left the zoo we grabbed a late lunch/early dinner at a pub that we could walk to from the zoo. 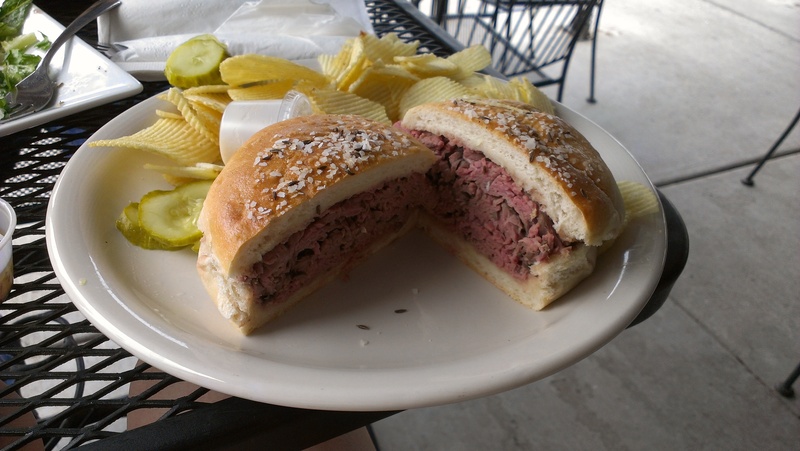 Of course I had to have Beef on Weck while I was there. Delicious!